Soak seeds from an orange, apple, grapefruit, lemon, or lime in water for a day or two. Fill several planters with potting soil and place three or four seeds in each one about half an inch deep. Water the seeds, place the pots in a sunny spot, and watch for the green shoots to grow. You can try plantings seeds in a pattern or shape: a letter, number, square, or circle. Give each child a paper bag and a list of natural objects (a bird’s feather, a leaf, a smooth rock, a pine cone, a wildflower, and so on) to collect. Give the same list to all the players or have each player look for a different group of objects. Challenge the children to find all the objects on their lists. Set a time limit: perhaps ten or twenty minutes to find ten objects. The first player to find all the items on his list is the winner. A child may play this game alone or with others. For a group of children, pair up non-readers with readers. 1. Select your plants. They should be small, like shade, and not grow too fast or too tall. 2. Put gravel on terrarium floor. 3.Sprinkle a small amount of activated charcoal on top. 4.Cover with a piece of screen with a slit cut in the middle. 5.Slice the sponge to one third inch wide and stick it in like a candle between the slit in the screen and anchor it in the gravel. The sponge will bring moisture up to the plant roots. 7.Gently make small holes and place plants in them, packing the soil loosely around them. 8. 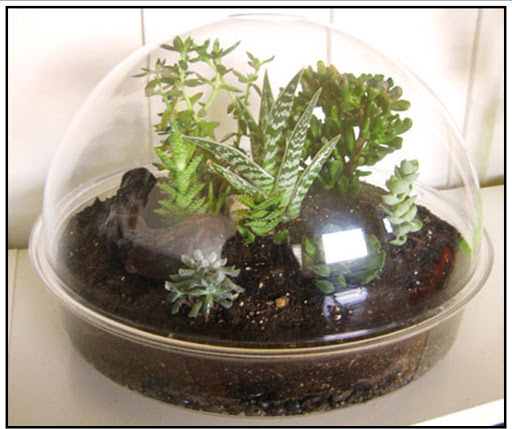 Spritz the plants with water and cover. Add small figures. The terrarium may look a little limp for a few days but will get used to its new environment in no time. 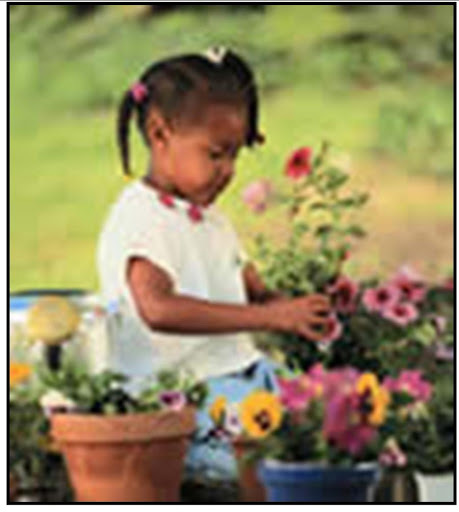 Do you have a favorite Earth Day project or activity to do with children? We are just going to take some pine cones we collected in winter and roll them in peanut butter, then in bird seed and put them in trees in the back yard. I will string some thread to hang them on branches.Thanks for the ideas because think how pleased the parents will be that you are putting in an effort to read books, watch videotapes and do projects with their kids! !Be sure to write in a daily log the book titles and project themes so that they realize you are putting an effort into the activities and resources! (Something unprofessional caregivers would never think are attempt to do). Effort and good intentions go a long way! !